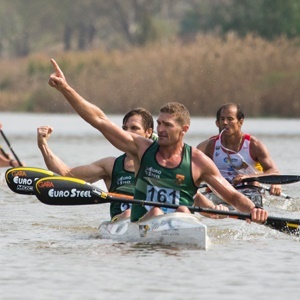 Pietermaritzburg - South African Hank McGregor claimed his second gold medal of the ICF Canoe Marathon World Championships by partnering Jasper Mocké to victory in the men's K2 race on Sunday at Camps Drift in Pietermaritzburg. Hungary emerged from the four days of competition as clearly the top nation at the Championships with their two silver and two gold medals on the final day's action taking their total for the competition to an incredible 20 medals (10 gold, eight silver and two bronze). South Africa were second on the medal table with eight medals (2 gold, 3 silver and 3 bronze) with Great Britain third on five (1, 1, 3). For South Africa, McGregor added a second gold to the one he earned for winning the K1 event on Saturday when he and Mocké added a fourth medal to their personal tally of two golds from 2014 and 2016 and silver from 2015. The local heroes produced a potent finish sprint to claim their victory, but behind them, in a bizarre photo-finish for second, the Hungarian pair of Adrián Boros and László Solti celebrated their second position before crossing the line. That allowed South Africa's second boat of Andy Birkett and 18-year-old schoolboy Jean van der Westhuyzen to finish just centimetres back in third. The top three were almost identical to the 2016 finish order when McGregor and Mocke beat Boros and Solti with Birkett and Louis Hattingh third. This win is also the third time the McGregor/Mocke and Boros/Solti combinations have shared the top two positions with the Hungarians winning in 2015 and grabbing silver last year. There was nothing easy about the final event of the championships with a massive group of boats jostling in a testosterone-laden bunch for the first lap until things broke apart and there were finally seven boats left halfway through the second lap as the paddlers headed for the first portage. That became five when the Hungarians were dropped just before the first portage and their hopes of a medal looked to be fading away as they slipped to more than 30 seconds behind the lead group. But, in an incredible show of power paddling, the Hungarian duo hauled themselves back into contention on lap six. From there it was a tight tactical battle until the final portage where, as with the K1 race on Saturday, McGregor and Birkett led the race to the water and then held the two lead positions through the top turn and into the final sprint for glory. As, as with Saturday, McGregor, this time with Mocké providing added power from the back of the boat, was able to keep his boat in front to claim his tenth World Championship gold medal. But for Birkett there was no repeat of Saturday as he and the young Van der Westhuyzen were no match for the potent power of the Boros and Solti and the Hungarian pair always looked to be the silver medallists once the sprint started. Luis Pérez and Miguel Llorens from Spain were fourth with Frenchmen Stéphane Boulanger and Jérémy Candy fifth and the final boat from the lead group, the Norwegian brothers Eivind and Jon Vold drifting over the line in sixth. After ten victories and three K1 and K2 double golds in 2014, 2016 and this year, it could be expected that McGregor would be a bit blasé about winning, but he seemed somewhat overwhelmed after his victory. "It hasn't quite sunk in yet to be honest," said the 2015 World Paddler of the Year. "I was never going for anything like this and to even win one world title is something special, but to win ten is incredible. "To win it here in front of the home fans with Jasper was special, and it rounded off a fantastic week for me with my family here. "The South African public always knew that we were good but to watch to happen first-hand will hopefully encourage people to get into paddling. "I think that somewhere along the line someone has been inspired to pick up a pair of paddles and give it a go. Earlier the young Hungarian crew of Vanda Kiszli and Sãra Anna Mihalik mixed the perfect balance of power, guile, tactics and patience to lead a Hungarian one-two and almost match McGregor when they both collected their second medals at the championships. Mihalik, who won the U23 women's K1 title on the opening day, and Kisli who on Saturday finished second in the women's K1 race, looked to be out-powered in the early exchanges with Britain's K1 women's winner Lani Belcher and her partner Hayleigh-Jayne Mason. The second Hungarian crew of Renáta Csay and Alexandra Bara, aiming to win their fourth women's K2 title in a row, always looked to be scratching in the lead group and the smart money was on the British crew leading home a Hungarian two-three. The Danish and South African crews, who made up the lead group until the final portage, were always struggling and there seemed little chance they would muscle in on the medals. However, on the final portage Kiszli and Mihalik showed that maybe their slowish portages throughout were nothing more than a ploy, and for the first time they put in ahead of their British rivals and had the advantage for the final 1 000m paddle to the finish. The move proved decisive as nobody from the front group was able to re-connect and Kiszli and Mihalik were able to get home relatively easily with clear water behind them. In the battle for the minor medals, Csay showed why she came into this championships with no less than 28 world championship to her name. The 2014, 2015 and 2016 championship winning crew came past Belcher and Mason fairly easily to claim the silver and relegate the Brits to third. The Danish duo of Emilie Rosenkilde and Henriette Engel Hansen were fourth on the wave of the final medallists, with South African's Hayley Nixon and Michelle Burn a distant fifth after they were left behind at the end of the final portage. Hungary picked up their third medal in two races when Márton Kövér and Ádám Dóczé outsprinted the Spanish duo of Ramon Ferro and Oscar Graña to claim the men's C2 gold. A trio of boats broke early, but just when it looked like a fascinating three-way tussle, the second Spanish crew of Manuel Antonio Campos and José Manuel Sánchez fell out while putting in after a portage and, despite a quick empty and recovery, were never able to re-connect with the leaders and had to settle for third. Up front there was little to choose between the two lead boats until the final sprint when the Hungarians unleashed an explosive kick that had the Spanish duo down paddles with 75m remaining.